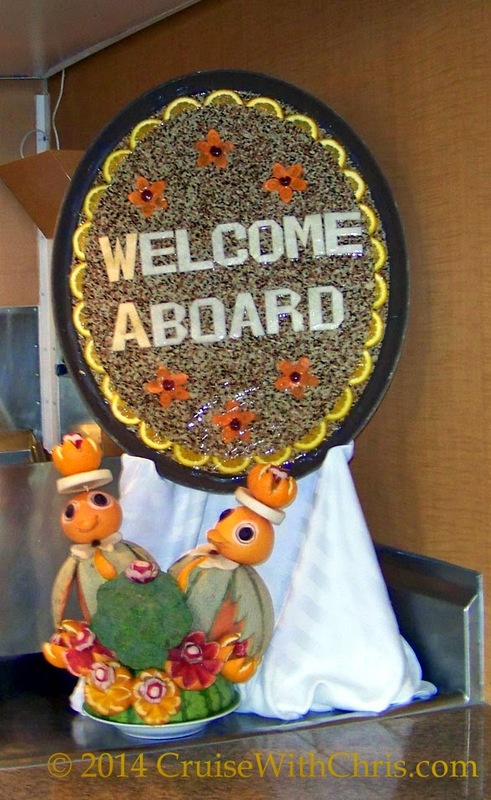 Welcome aboard - your cabin is being prepared - join us in the buffet for lunch while you wait. We've just completed our series on Hurricane Preparedness and decided that we should find something a bit lighter to talk about. So, looking through our photo archives, we stumbled upon this image from our Celebrity Century cruise to the Arctic Circle & North Cape. Furthermore, we decided that we'd create a new Pinterest board and start pinning more of these Fruit Art images. When we entered the buffet, these fruit people greeted us and we definitely felt welcome. Creations like these are made by some very talented crew members, whose only mission is to make every moment on board the ship enjoyable. 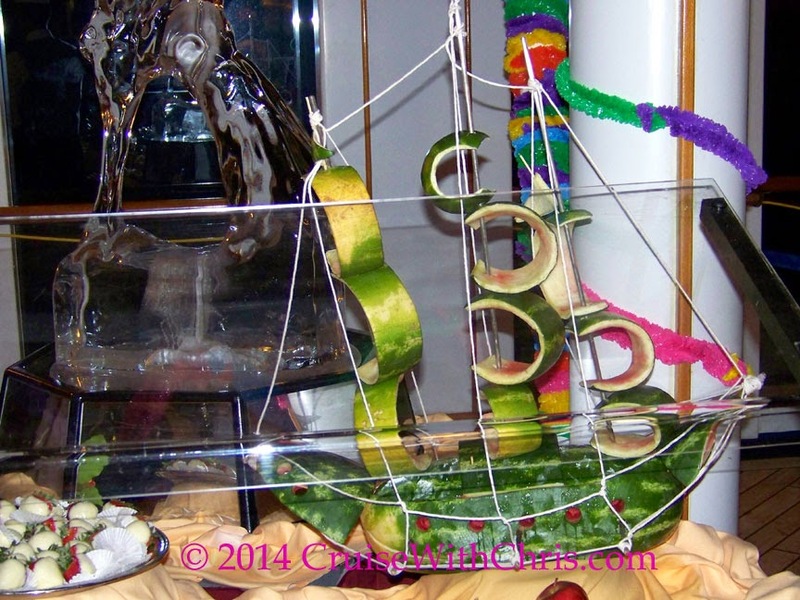 Turning back the clock a bit, besides finding fruit art in the welcome aboard buffet, it wasn't unusual for there to be an evening set aside during the cruise to showcase the work of these talented individuals. This image was captured on Celebrity Zenith, which is no longer part of the Celebrity Cruises fleet. One evening the late night buffet featured these fruit creations. Grand buffets are pretty much a thing of the past, but there still are many opportunities to view the handiwork of talented crew members. Some of our favorite fruit art was carved out of watermelons. 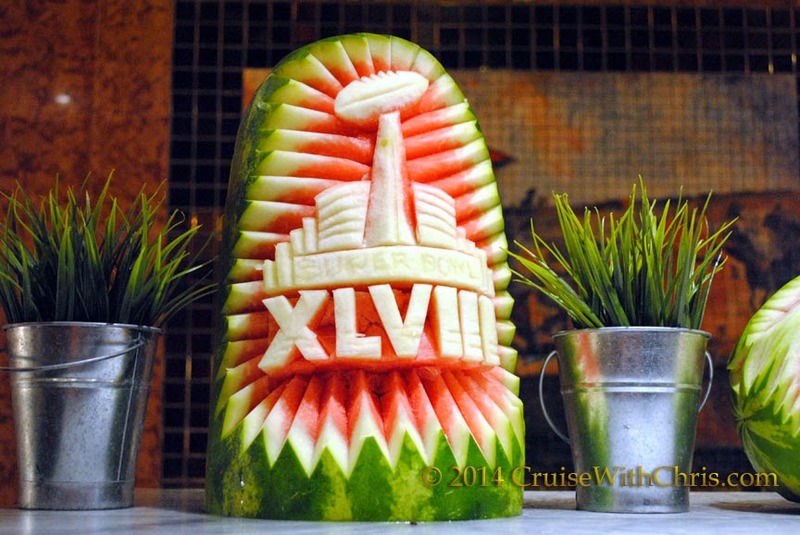 This image was captured during our Carnival Conquest cruise which happened to coincide with this year's Superbowl game. 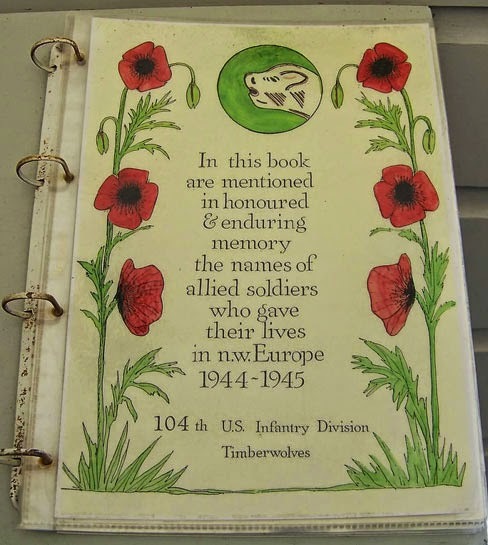 Just look at the intricacy of this design. We have many more example of watermelon fruit art in our new Pinterest board. We are doubtful that the ship on the right is sea worthy. 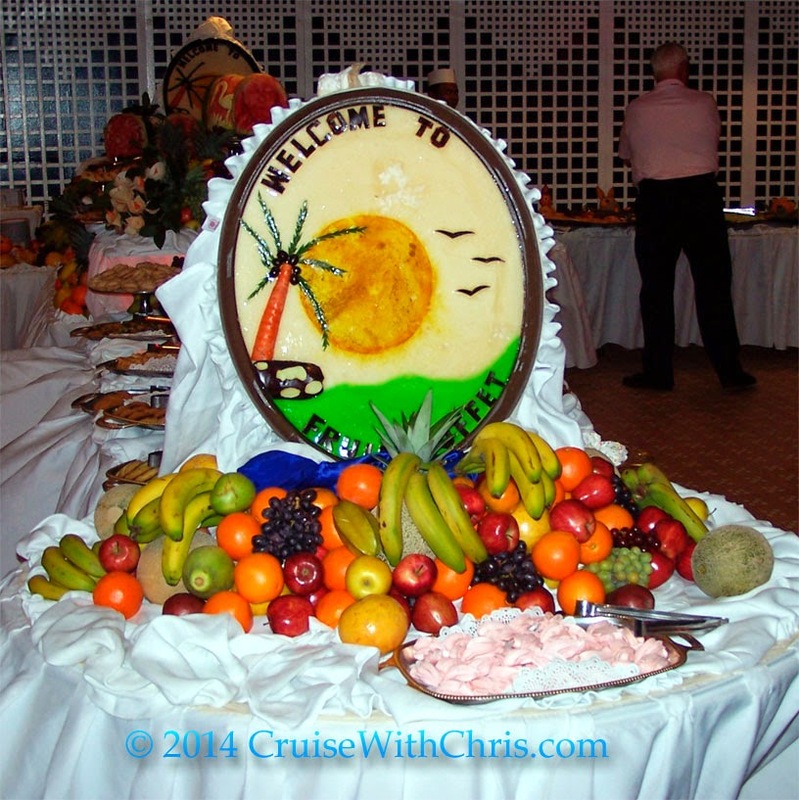 However, it definitely is worthy of inclusion in our Cruise Fruit Art collection. Click here to visit our Pinterest board and see more of these fun fruit sculptures. Do you have any images that you'd like to contribute? 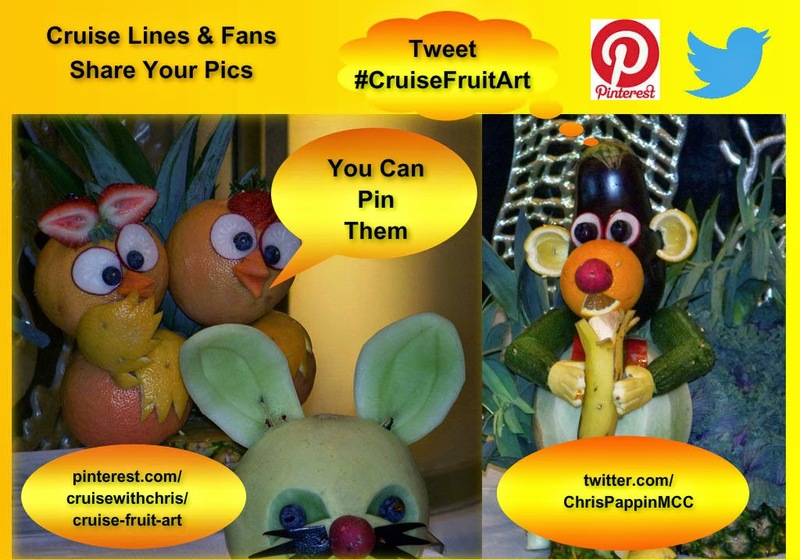 Which cruise line has the best fruit art? 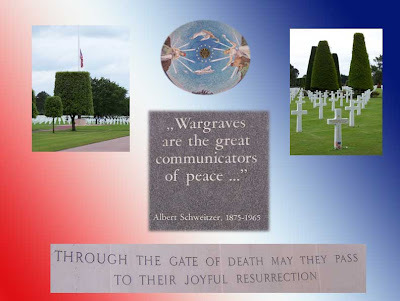 We'll start things off with several images from our archives. Include information about the Cruise Line in your pin / tweet so that we can see who has the most creative artists. 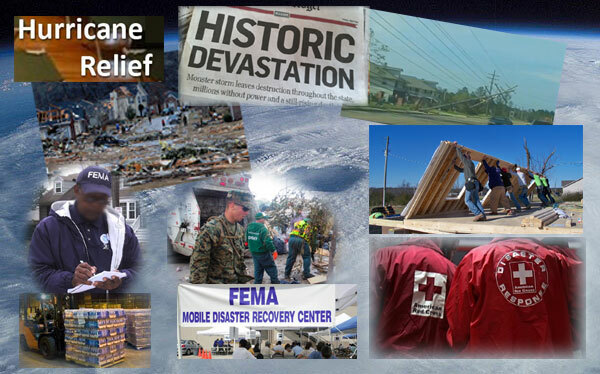 We conclude our coverage of the 2014 Hurricane Preparedness Week by looking at recovering from the storm. Three organizations come to mind when you think about the aftermath of a hurricane or other natural disaster: FEMA, Red Cross, and the National Guard. There are many other organizations and individuals that also play a key role in providing immediate and long-term assistance to those impacted by the hazards of hurricanes and other natural disasters. A normal to below normal hurricane season is expected for the Atlantic Basin this year according to the seasonal outlook issued by NOAA’s Climate Prediction Center. 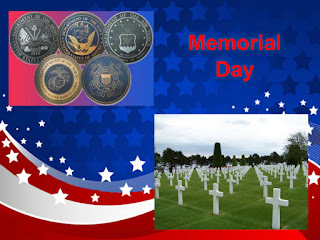 See Related Blog Posts section below for links to NOAA outlooks for each region as well as hurricane preparedness information. “The U.S. was spared from a hurricane last year, but that does not mean we will be as fortunate during the 2014 season,” said Rick Knabb, Ph.D., director of NOAA’s National Hurricane Center. "Prepare for a hurricane now before one threatens your area, and find out if you are in a hurricane evacuation zone." 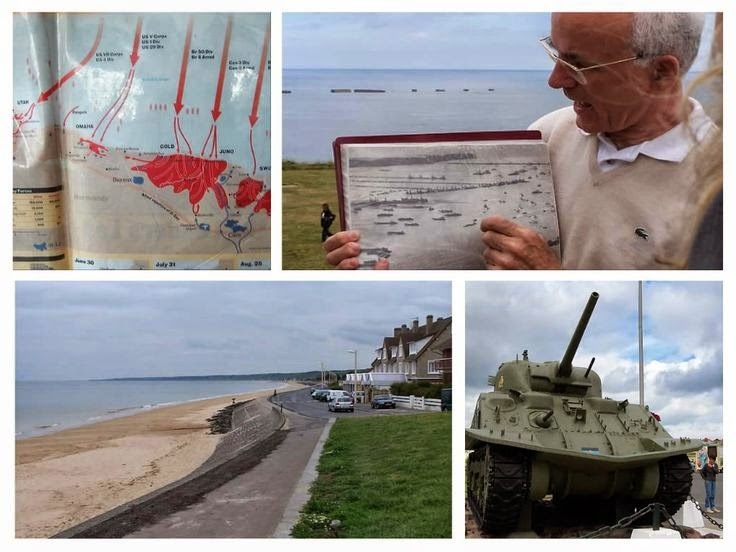 Want To See More Spectacular Views? 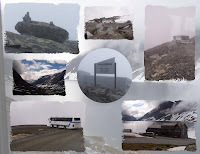 Imagine a place where you'll see fertile valleys, majestic mountains, waterfalls and glaciers. 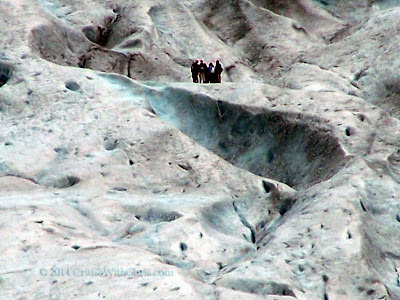 Yes, you can even get up close to a glacier like the people in this picture. 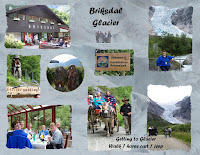 Join us on our journey to Norway and the exquisite Norwegian Fjords. 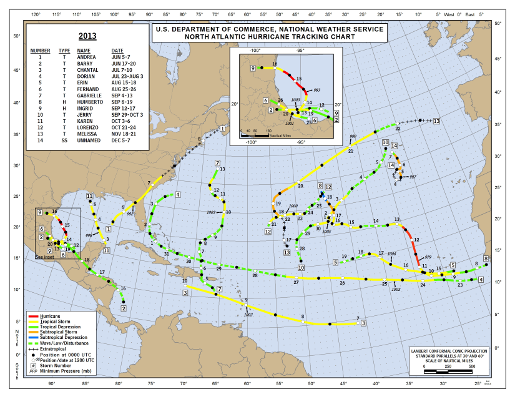 We continue our coverage of the 2014 Hurricane Preparedness Week by looking at the tropical weather forecasting process. We continue our coverage of the 2014 Hurricane Preparedness Week by looking at another of the hurricane hazards. In particular, we'll look at Inland Flooding. We continue our coverage of the 2014 Hurricane Preparedness Week by looking at two more of the hurricane hazards. In particular, we'll look at High Wind and Tornadoes. 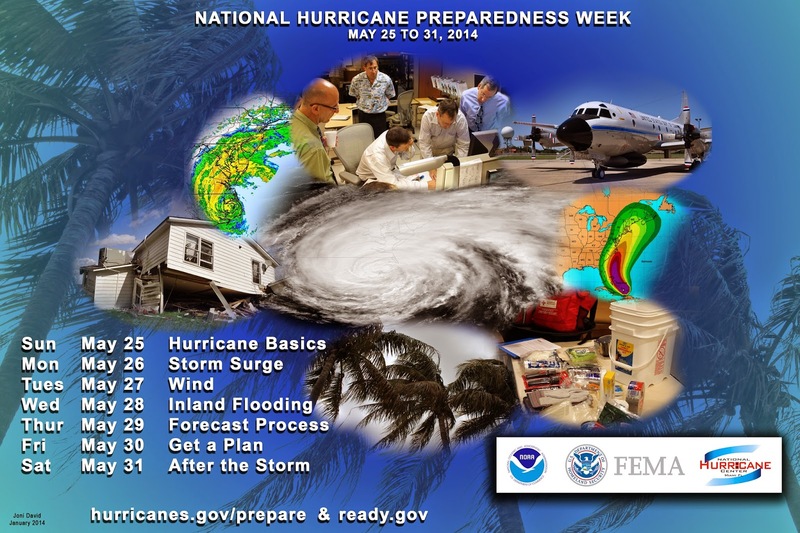 We continue our coverage of the 2014 Hurricane Preparedness Week by looking at some of the hurricane hazards. In particular, we'll start by examining the greatest potential for loss of life related to a hurricane, the storm surge. 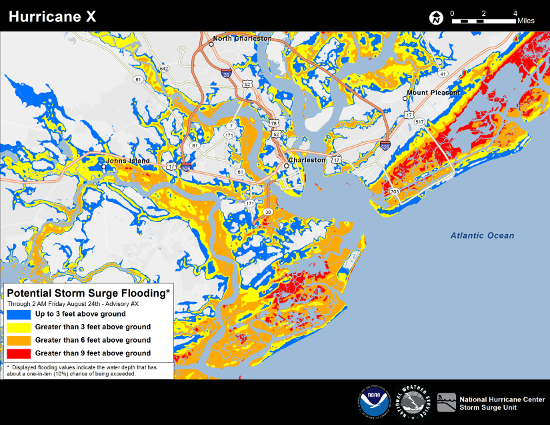 Surge Flooding Map issued by the National Hurricane Center (NHC). President Obama declared May 25 - May 31 “National Hurricane Preparedness Week." FEMA, along with the National Oceanic and Atmospheric Administration (NOAA), is helping to raise awareness of steps that can be taken to help protect citizens, and their communities and property. Hurricanes are classified into five categories based on their wind speed, central pressure, and damage potential. Category Three and higher hurricanes are considered major hurricanes, though Categories One and Two are still extremely dangerous and warrant your full attention.The following chart details the categories and the damage that can result from a storm with that strength. In the following article, we look at the 2014 Hurricane season in review, comparing the forecast to actual results. We also look at NOAA and Colorado State University forecasts for the 2014 Season. We will continue coverage of Hurricane Preparedness Week by looking at some of the hazards starting tomorrow. Additional Hurricane information can be found in our static Hurricane Zone tab. The 2014 East Pacific Hurricane Season officially started on May 15th and the first Tropical Depression formed a few days later on May 22nd. It formed well southwest of Mexico and has strengthened to a tropical storm. Hurricane AMANDA ...AMANDA WEAKENS... As of 2:00 PM PDT Tue May 27 the center of AMANDA was located near 15.0, -112.6 with movement NNW at 5 mph. The minimum central pressure was 970 mb with maximum sustained winds of about 105 mph.